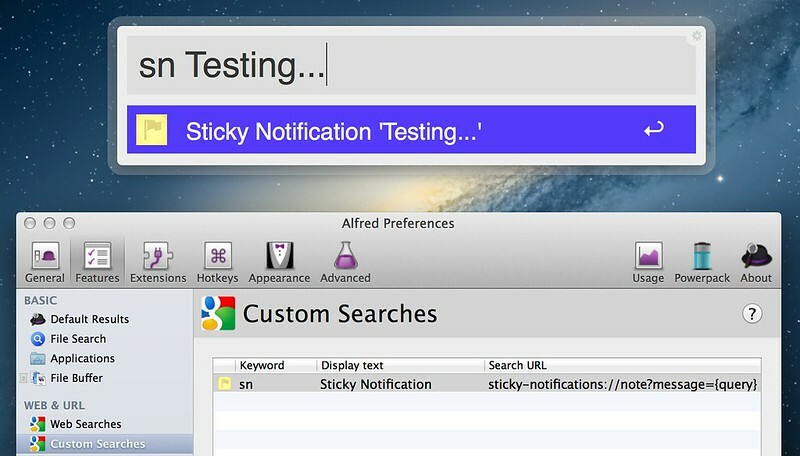 Just in time for the weekend, I’ve released version 1.0.3 of my recently-launched Mac app, Sticky Notifications. This is the latest of three small updates this week (and yes, I promise to wait a while before the next one - forgive my enthusiasm). If you’re already using the app, you should check for updates using the action (cog) menu in the main window, or via the Preferences. If you don’t have the app already, you can download it here. I’ve made a few interesting additions in the area of integration and interoperability, which I’d like to talk about here. You can also read the list of changes, if you’re so inclined. There’s now a standard System Service, which operates on any selected text. As with all services, you can access it from either the “Services” submenu in the application menu for whatever app you’re using, or from the right-click contextual menu. You can enable the service (and configure a keyboard shortcut for it, if you like) in the “Keyboard Shortcuts” tab of Keyboard pane in System Preferences - the service is called “Make Sticky Notification”, and it’ll be in the “Text” section of the Services list. Note that Sticky Notifications should be in your Applications folder, to make sure that OS X notices that it provides a service. 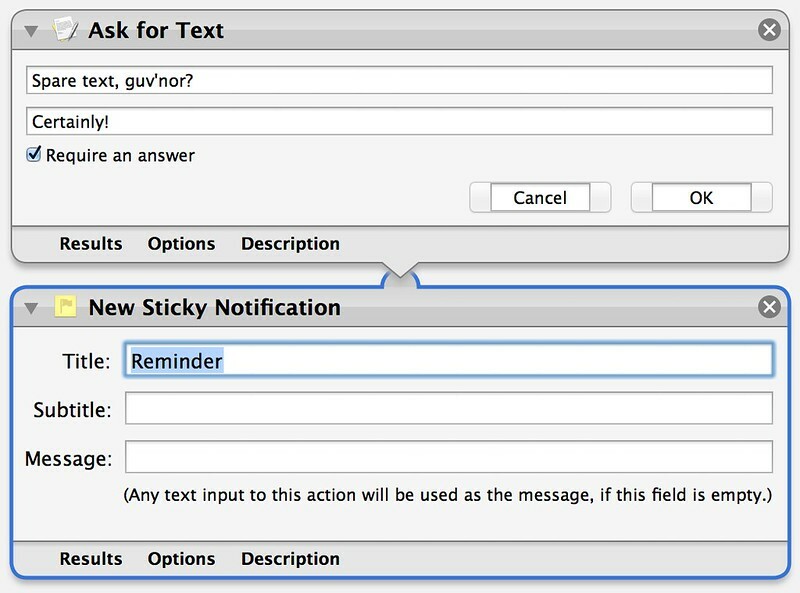 Sticky Notifications now also provides an Automator action, so you can integrate notifications into your workflows. As with the System Service, you should ensure that the app is in the Applications folder for this to work. Use note (shown above) to create the notification immediately. Or use prepare to populate and show the New Notification window. Use title, subtitle, and/or message query-parameters (all URL-encoded; all optional), e.g. ?message=Hello%20World. If you already have Sticky Notifications 1.0.3 or later installed, this link will say hello. This is great for integrating with utilities that can feed your (suitably URL-encoded) input to a custom URL-handler, such as Alfred’s “Custom Searches” feature. If you already have Alfred and Sticky Notifications 1.0.3 (or later) installed, you can click this link to quickly set Alfred up for that purpose. You might also want to tell Alfred to use Sticky Notifications’ icon for the custom search, as in my screenshot above. If you’re a LaunchBar user, you can do the same thing with a custom Search Template (or by triggering Sticky Notifications’ service from within LaunchBar). I hope that this update will make Sticky Notifications more useful on your Mac. I hope you’ll give it a try if you haven’t already. If you’re a journalist, feel free to contact me for a review license key; you may also be interested in this press kit of Retina screenshots.